Do you own the UK’s rarest 50p piece? And it’s not Kew Gardens. 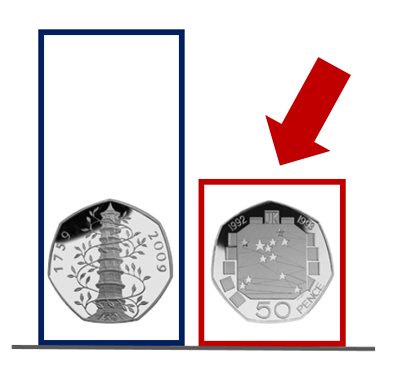 Last week a 50p coin that many thousands of people have found in their daily pocket change started to be sold on e-Bay for prices upward of £100.00. Or to put it another way, 200 times its actual value! Only 109,000 1992 EC 50p were issued into circulation – roughly half of the Kew Gardens 50p. It was all because the Royal Mint announced that the Kew Gardens 50p coins is the UK’s most scarce circulation coin, with just 210,000 pieces ever been placed into circulation. The result was a media storm and the inevitable overnight ramping of prices. But what few people realise is that there is an even rarer UK 50p piece that was issued in half the number of the Kew Gardens coin – just 109,000 coins. The coin was issued in 1992 to mark the EC Single Market and the UK presidency of the Council of Ministers – perhaps not the most popular of topics, which maybe was the reason so very few were pushed out into circulation. But of course, its lack of popularity at the time, is the very thing that now makes its Britain’s rarest 50p coin. Sadly, however hard you search, unlike the Kew Gardens 50p, you will not find this one in your change. That’s because it is one of the old-sized 50p coins that were demonetised in 1998. But it won’t be the coin’s clever design that will guarantee its numismatic interest for years to come. It is its status as the UK’s most rare circulation 50p is what will intrigue collectors and have them searching and saving up in years to come. Are you interested in owning the UK’s rarest 50p coin? Limited stocks of the 1992 EC 50p coin are available from The Westminster Collection for £20. Hi Ward, unfortunately we can’t offer valuations however it’s great to have coins in your collection that are over 100 years old and also that span such important dates in our national history. Thanks, Robin. Hi I have an Edinburgh £1 coin from 2011 and the leek and daffodil £1 coin. I’ve been told they are collectible, is this true? Hi Emma, yes! The Edinburgh coin is the rarest £1 coin out there. You can see the details on the Change Checker Scarcity Index here: https://blog.changechecker.org/2017/02/20/the-new-1-scarcity-index-reveals-which-1-coins-are-the-rarest/ Thanks, Robin.